Perfect, definitely a top 5 hostel for me. 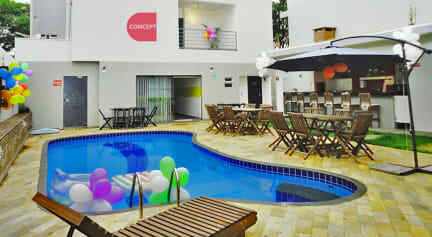 Modern, clean, secure with a good atmosphere to meet other travelers. Great location, awesome staff! The public bus stop is on the corner and is very easy to go to the iguazy falls from there. Stayed here for 1 night whilst passing through Foz. Very clean and comfortable dorm. Large bunks with own light and charging port. Separate toilet and shower in the room too. Would certainly recommend. Cleanest, most comfortable hostel I have stayed at in South America! Really modern hostel, great facilities, huge rooms with nice bunks and big lockers. Staff were friendly and helpful. Location was good for bus station to the falls, but quite far from the center and not much going on nearby. Hostel itself had a good bar, but was really quiet and lacking a bit of atmosphere when we were there. Really nice clean and comfortable hostel, very modern and awesome a/c. Drinks are a little expensive but that's most of Brazil, I think a good idea would be to have like one free drink between a certain time, helps get everyone together to socialize more.